Okay! Musume Time: My Baby Nephew has Arrived!!! 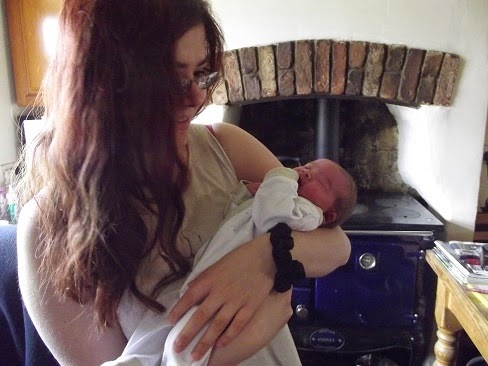 On May 1st 2014 at 10:30pm, my baby nephew was born to my older sister (34/36, I think?) and has finally joined our family after our long, impatient wait! Welcome to the family, Little Monkey! After three years of my sisters struggle to carry a baby, and also after losing two of her sons through miscarriage, my amazing older sister carried the baby who would be her fourth son to full term and finally, he has arrived! We have waited for him for three years, and now he has arrived and we couldn't be happier to see him! For us all in my ever-growing family, he is precious and a reminder just like his older cousin (my beautiful baby niece) that there is always life after death no matter what, and that happiness is sure to follow if you endure through the pain and sadness. He is tiny, his cry is small, but he is adorable and he will be so loved by our family. His big brother already seems to be protective of him (even when he denies it) and my baby niece finds him rather wonderful too, given how curious she is around him! He is sweet, and we adore him already.